I have an abiding mistrust of battery-operated gee-gaws that are supposed to make my guns work better. My basement is a veritable graveyard of electronic gadgets that suddenly and mysteriously quit working, never to come to life again. Being a dedicated adherent to Murphy’s Law, I have observed that the tool with the fewest parts tends to be the one still functional at the end of the day. I have sent any number of mowers to lawnmower heaven, but Granny’s garden hoe still works. So, is there any room in my Luddite self-defense universe for a 21st Century laser aiming device? Maybe so, and besides, they’re really cool. The Crimson Trace Lasergrip is a creative concept which integrates a laser aiming device into the right grip panel of the gun. The grips are sculpted to nearly the same shape as the original grips so that all of your holsters still work. There is only a small hump at the top of the right panel under which the laser is mounted and the activation switch midway down the front of the grip. The grips are made of a sturdy black polymer plastic material (or combat rubber depending on which model you buy) that is tough and feels good in your hand. Lasergrips are installed by simply replacing the factory grips. In the case of the snubnose, this mean one screw and you’re done. No other modifications need to be done to the gun. It is adjusted for windage and elevation with two of the tiniest Allen wrenches I have ever seen. It is powered by two wafer-style 2032 lithium batteries. So, what can Lasergrips do for you? The first thing that got my attention with the Lasergrips was their capacity to give instant visual feedback for what I was doing with the gun. The little red dot will quickly show you if you are milking the trigger, flinching, or pulling your shots to one side or the other. People with “mixed dominance” vision (right-handers with left-dominant eyes and vice-versa) can get a clear sense of the tricks their eyes may be playing with their sight picture. While it’s a controversial technique, point shooting can be dramatically improved by watching the dot when you draw. At twenty five yards, I found it easy to keep all the shot in the A-zone while holding the gun at approximately chest level and putting the red dot on the target without ever looking through the sights. I have pretty good eyes, so Im speculating, but I have a hunch that people with impaired vision would be helped in getting onto the target by the laser, and I think they would find it much easer to get good hits with the laser than by trying to use iron sights. Instructors could be assisted in diagnosing problems by watching the student and observing the behavior of the laser on the target. I never have been overwhelmed with Tritium night sights. They’re better than no illumination at all, but not by a whole lot. The laser sight is much quicker and more positive in low light conditions. Its not a flashlight, although it does splash a little bit of light around. If you’re going into a pitch-black darkness, you still need a flashlight, but if there is any ambient light at all, the laser will get you on target quickly and in a very positive way without having to force your vision through those dim Tritium notches and posts. The advantage that the Tritium does have over the laser is that they don’t give away your position like a laser beam can. Crimson Trace Lasergrips are no replacement for iron sights, and if I had to make a very precise shot, I would still rely on the iron sights as long as I could see them. At the same time, getting the red dot on the target is very quick and bypasses the need to align the rear notch, the front post and the target. It is a medical fact that as we age, the eyeballs become less flexible. The eyes adjust their focal point by flexing, becoming slightly longer or shorter to focus at different points in the distance. Older eyes, being less flexible, do not adjust as quickly or at all to different focal points. Some people have difficulty getting a sight picture even under optimum conditions. For those with less than perfect vision, getting a sight picture can be slow, and they may not even be able to get just the front sight in focus well enough to make the shot. In these situations, Lasergrips can be a real help in getting on the target quickly. With relatively good vision, corrected with glasses, I found that getting the dot on target quickly in a match setting was easy. I have always had a tendency to drop my shots just a bit, and when you’re shooting Pepper poppers at a distance, dropping the shot can cause the popper not to drop by hitting it too low. Using the laser sight, my percentage of quality hits definitely improved on the poppers at longer distance. At closer distance, I think the laser may have actually slowed me down just a bit because I was looking for the red dot rather than just shooting the target with front sight press. One situation did completely defeat the Lasergrips. A popper had been painted fluorescent orange and the red dot simply disappeared in the orange paint. I had to revert to iron sights on that one. With the relatively poor sights found on most snubnose revolvers, the CT grips are really helpful. I have done the experiment of taking people to the range and letting them shoot with similar guns, but with one equipped with a laser sight and one not so equipped. The result is always the same. People shoot tighter patterns quicker using the lasers. When using iron sights, you must place at least part of your head behind the gun, and expose the gun and some of your face and head to hostile fire. With the Lasergrips, if you can see the target you can aim the pistol without exposing as much of your head. Under certain circumstances, this could be a distinct tactical advantage. Additionally, an officer who was down and wounded could still aim his pistol even if his wounds prevented him from aiming the pistol in the normal way. In a team context, the laser sight could be used as a pointer to indicate the position of a hostile or to signal potential paths of movement without making any sound. In a team training setting, the laser can be used to increase muzzle awareness and allow instructors to see clearly who is covering who. I love euphemisms like this. “Threat de-escalation” simply means making the little red dot dance on the chest of a potential evil-doer and producing a rapid change of heart in said evil doer by giving him a clear visualization of where the hole is going to go if he decides to pursue his current course of action. Of all the benefits of the Lasergrips, this one is the most problematic for me. Why? Well, there’s no assurance that the aggressor is going to see the dot and make the right decision about it in the desired time frame. Second, this capability could tempt a person to draw and point their gun at a person in order to control them, but this could leave the user open to a charge of brandishing or even assault with a deadly weapon. Put another way, pointing a gun at another person has serious legal ramifications, and should only be done in circumstances that justify the use of deadly force. Nevertheless, a goodly number of police officers and soldiers have reported successful “de-escalations” in violent aggressive subjects with the use of the laser, and if the laser legally applied prevents a shooting, that’s a plus. They aren’t a replacement for your iron sights. They aren’t a shortcut to practice and good marksmanship. They aren’t a flash light, and most of all, they aren’t a cool toy with which to intimidate and mess with people’s heads. A couple of years ago a cadet in our local police department got into a verbal confrontation with a patron at a bar. The cadet was in uniform and, while tempers apparently got heated, the mouthy bar patron finally backed down and left. But as he walked away, the cadet drew her service pistol which was equipped with a laser sight and put the dot between the patron’s shoulder blades. This moment of indiscretion resulted in the cadet losing her job and the possibility of ever working as a police officer. Had she been a civilian, she probably would have been charged with a felony. The moral of that story is, don’t put the little red dot anywhere that it wouldn’t be appropriate to put a bullet. “I teach basic to advanced building search classes and SWAT tactics. I have been using the Crimson Trace laser on my Glock 17 for almost five years now. [We will forgive the captain for his poor taste in guns for now] I use my weapon each time I instruct to demonstrate the use of white light as well as the tactical advantage a laser sight has in a CQB/building search environment. I carry my weapon on a daily basis while on and off duty, subjecting it to the daily ‘wear and tear’ of being jostled about and bumped around while getting in and out of a unit, etc. It has never failed to function properly when I needed it. More importantly, I also work the major holidays on the Colorado River for our Department’s Boating under the Influence (BUI) Program. This duty requires being on the water in a patrol boat 10 to 12 hours a day. It is not uncommon to respond to emergencies that require entering the water to assist someone. When this occurs there is no time to remove your weapon or other gear. The first time I went in the water with my weapon on I didn’t give a thought to the fact that I subjected the laser system and its electrical components to complete emersion in water. Later, after I got off duty, I was in the process of getting ready to clean my weapon when it dawned on me that I had probably destroyed the laser system by going in the water with it. I hit the pressure switch, and quite honestly, to my amazement IT WORKED! I can’t tell you the amount of times I have been in and out of the water with my weapon on, but each time I go in so does Crimson Trace’s Laser System. It has never failed to work when I need it, even after being completely immersed in water on numerous occasions. This is quite a testament to the reliability and durability of your product. I thought it important for you to know this and be able to tell other users of the reliability of your system and the type of abuse it can be subject to and still operate. My name is SSG Sieler. I am currently deployed in Tikrit Northern Iraq in support of Operation Iraqi Freedom with B Company 2-4 Aviation Regiment 4th Infantry Division. I purchased one of your outstanding sighting systems to go with my Aviation Life Support Equipment. I use it everyday and must say that it is one of the best combat multipliers I have in this combat theater. I must honestly say it has saved lives over here. Not only those of U.S. services members but also the lives of Iraqis. Often we are faced with tense situations where the “little red dot” makes the difference between the use of deadly force or the power of intimidation. Even with the language barrier the little red dot speaks volumes for us. I’m sure you have had soldiers here try to contact you to purchase ones for themselves, as everyone I run into loves mine. The environment here is extremely inhospitable and my M-9 takes a beating on a daily basis. The OPTEMPO in Army Aviation here is staggering and all the aircrews carry the Berretta 9mm. Many soldiers here have bolt-on personal sighting devices but none are as transparent in use, (your grips fit just like the original equipment and never hinder operations as others do) or nearly as durable. Mine has outlasted all the others. Once again I would like to thank you for an outstanding product. It has made my job that much easier. I have no idea how I ever got along without it. They run on batteries. I will never completely trust anything that runs on batteries. I feel compelled to test the laser every time I put the gun on which runs the batteries down. 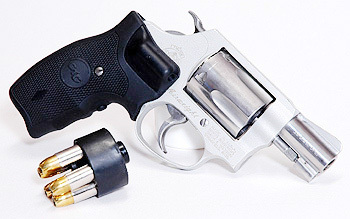 The grips shown above are the Model LG 305 which are the larger of the two models made for S&W J-frames. Crimson Trace also makes a smaller version, the Model LG 405 which are closer to the size of boot grips. The Model LG 305 grips are longer and a bit wider than boot grips. The increased size of these grips improves comfort and control when firing without giving up too much in terms of conceal-ability. For a person who prefers pocket carry, the more compact Model LG 405 would probably be better. One drawback on the Model LG 305 is that holsters which use a thumb-break around the backstrap of the grip such as Galco shoulder holsters, will no longer fit when the 305’s are installed. While the snubnose may point very naturally, its small grip, short sight radius and heavy trigger make it a difficult handgun to shoot accurately. Additionally, the sights on most snubbies are nominal and often hard to see, especially in low light and for people who may not have good eyesight. Lasergrips make a quick index on the target in poor visual conditions easy. The question has been raised that looking for the red dot might actually slow down the shooter in an emergency. This is an issue which should be considered. If you are already fast and practiced enough that you can snap off a shot in the twinkling of an eye and get a good hit, the Lasergrips might not be an asset in a speed shooting situation. I have been practicing for fast shots much longer than Lasergrips have been around, and I retain a certain mistrust of electronic gadgets. In a spitting-distance slug fest, I might not worry about the red dot or take time to look for it. However, in bad light conditions and when the target is somewhat further away, like 10-20 yards, the Lasergrips really speed up your target acquisition. In the “putting your money where your mouth is” column, I have two sets of CT grips, one for J-frame and one set on my Commander. Additionally, I have an Insight X2 light/laser sight combo on my Springfield XD-9. I like the laser sights. 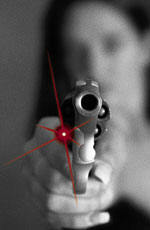 Crimson Trace Lasergrips are an innovative concept that can provide a number of training and tactical advantages. I wouldn’t consider them something I couldn’t live without, but many tactical situations and circumstances come to mind in which the Lasegrips could be a significant asset. They are a meaningful assist in aiming the snubnose revolver. Dot Size: Approximately 0.5″ diameter at 50 feet. Beam Intensity: 5mw peak, 633nm, class IIIa laser. Maximum output that federal law and technology allow. Also available in infrared for law enforcement and military only. Power Source: Two #2032 lithium batteries (included). Provide over four hours on on-time use and have a five-year shelf life. Activation: Integrated momentary pressure switch(s) (all models) and a master on/off switch (most models). Adjustment: Fully adjustable for windage and elevation with Crimson Trace’s precise sight-lock calibration screws. Warranty: Full three-year no hassle warranty on all parts and labor.